AMAZING and GREAT customer service too! 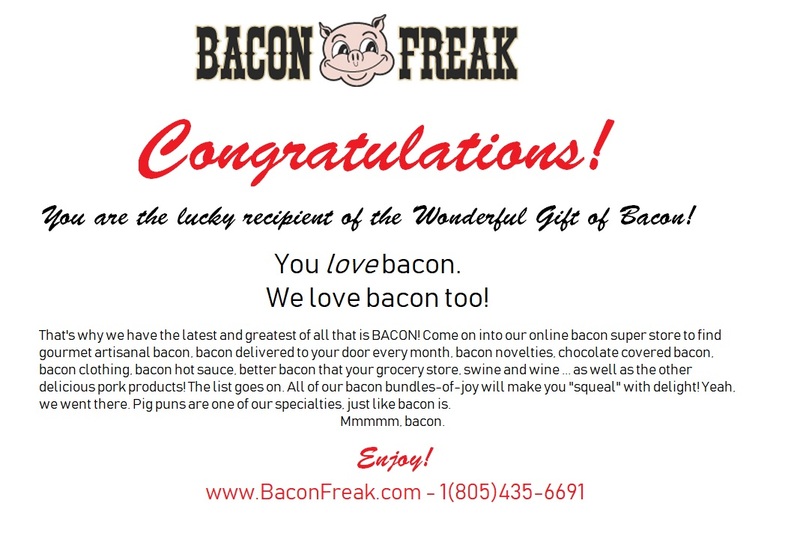 We love Baconfreak and have sent packages to my students' teacher, as well as family and friends. They provide awesome products. When one delivery did not arrive the customer service I received was OUTSTANDING! We will use them for many years to come! Gave as gifts. Recipients absolutely LOVED all of the bacon. I will continue to purchase your products. The best around. These bacon flavors are delicious.. These bacon flavors are delicious...They are very rich in flavor, so that when I could eat a whole pound (lol) of regular bacon, 2 or 3 slices are plenty. I have now frozen packages of Bacon Freak bacon in my freezer for guests also. Like the coupons they offered. I placed two orders bacon combo pack, for my son in law for Father Day and both of my son in law are very happy with this gift. so I will continue to get them bacon. The maple flavored bacon has an odd taste to it. The peppered bacon is a little too spicy for kids. One pack had more salt than I would usually prefer but the thickness of the slices and flavor made up for it. Two thumbs up!